If Visa Wellington on a Plate has taught me anything, it’s that burgers are serious business in Wellington. In this city, we don’t want none unless you’ve got buns, hun.  Every year, we anxiously await the announcement of the Burger Wellington finalists to see whether our favourites made it through. I tasted 17 of this year’s burgers (though admittedly I had the luxury of a head start), but only three of those made it through to the finals. What pushed the others over the line into Top 5 territory? Was my FOMO going to kick into overdrive yet again for having missed out on one of The Burger's of The Year? Seventeen days of burger mania came to a head tonight at Le Cordon Bleu, as the eight finalists gathered to dish up their burgers for the final judging. The public’s scoring determined the five finalists for Best Burger and Best Burger + Beer Match. Two finalists, Apache and Little Beer Quarter, had two chances to walk away with a title. This year’s judges, tasked with the all-important responsibility of crowning our champions, were Laura Greenfield of Field & Green, Chef Francis Motta of Le Cordon Bleu, and Chris Maiyaven, the lucky punter who won his place at the judging table by eating and scoring his way through Burger Wellington. The judges would be looking closely at each burger's appearance, flavour, innovation and the inclusion of Wellington ingredients. VWOAP Festival Director Sarah Meikle kicked things off by running through how the evening would work. Photographers and a news crew scrambled to get into prime position to record all the action. A pointed silence descended on the room as the finalists filed into the kitchen to set up, game faces on.  Like I said – serious business. Friends and supporters were on hand to observe from behind the glass partitions, drinking Garage Project beer as they watched the finalists cook, as is the Kiwi way. It was like watching a controlled experiment behind a one-way mirror, or a less shouty version of Hell’s Kitchen. The polite smattering of applause as each burger was presented punctuated the simmering atmosphere. First off the burger line was Hippopotamus’ Sweet As Burger, a mind-bending dessert burger that looks just like a meat burger – chocolate parfait, raspberry jelly, fruit gels and crème fraiche make for convincing substitutes. Would starting with dessert put them in the judges’ good books? Our sole food truck finalist was Nanny’s Food Truck with Mark 2.0, a solid beef and lamb burger sandwiched between two doughnuts. This monster of a burger oozed flavour – literally – leaving my fingers coated with chipotle sauce. Our third burger of the evening also took an unconventional bun approach. Beach Road Deli’s Pizza Burger Burger Pizza lived up to its name, stacking beef, cheese, onion rings and a zingy horseradish crème ricotta between two mini pizzas. This odd couple burger brought together the best of both worlds, and the results were flat-out amazing. Up next was Apache’s Bang Bang Burger. 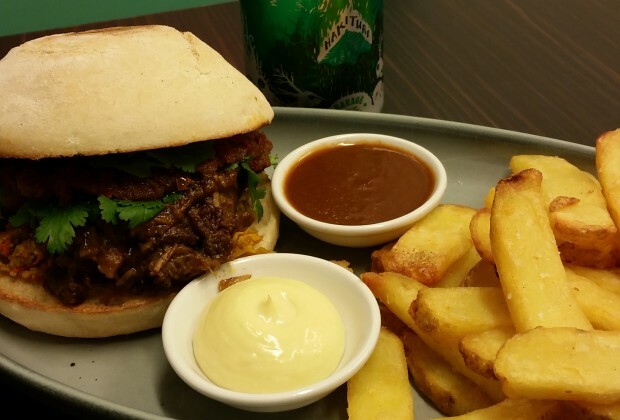 This beautifully presented burger featured lemongrass chicken, mango and a chili, lime and coconut mayonnaise. With just one bite I could see why this was one of the most-talked-about during VWOAP –the flavours were fresh and expertly balanced, with the mango giving that extra kick of fruity sweetness. Bang bang…this burger shot me down! Garage Project’s Death From Above was the matching beer. For the Reinheitsburger, Little Beer Quarter took traditional brewing guidelines and incorporated them into the various components of the burger, from IPA infused-cheese to a malted barley bun. There’s no denying that this burger is intimidating in both size and flavour. Little Beer Quarter clearly know their beers and their burgers, and chose to match this delicious morsel with Garage Project’s spiky Pernicious Weed. 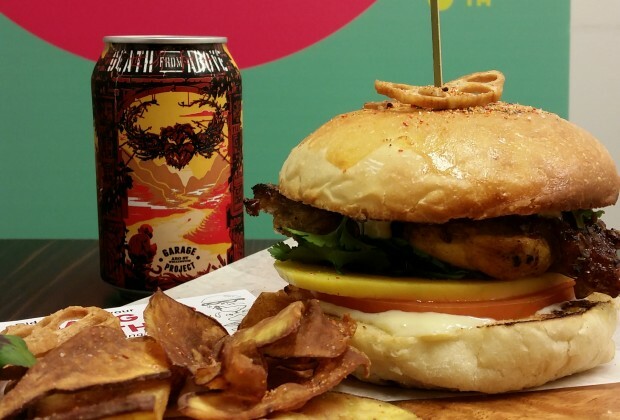 Last year’s Best Burger + Beer Match winners Laundry return to the finals this year with their Sumatran Steak Burger, inspired by the food and beer encountered during a surfing trip to Indonesia. Tender braised steak with Sumatran spices brought lots of warm, comforting flavour. Laundry’s beer match of choice this year was Garage Project’s Hakituri. Louis Sergeant’s Le Canard Du Roy was by far the richest burger of the night, with duck confit and duck liver parfait, prune chutney and a truffle mayonnaise. This was a burger to be savoured, ideally with Garage Project Aro Noir to wash it all down. Finally, last year’s Best Burger champions Egmont Street Eatery served up the Sichuan Two-tooth, a mutton patty with a spiky Sichuan sauce and pickled celery wrapped in a bao bun. Like all great Sichuan dishes, this burger brought hot and sour together, delivering a surprising end to the night's taste testing. And with that, our judges disappeared into a private room to deliberate, emerging 21 minutes later to make their announcements to a waiting crowd. Drumroll! 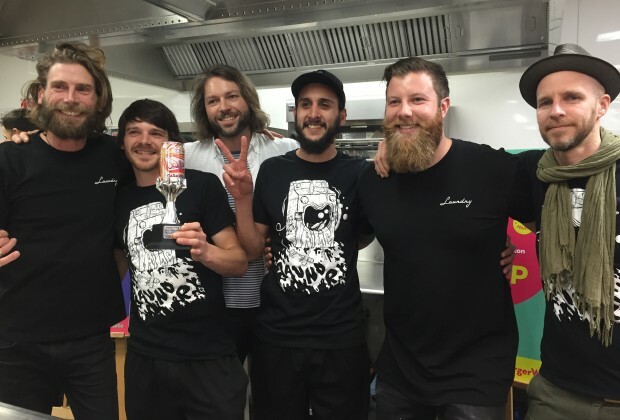 Garage Project's Jos Ruffell presented the Best Burger + Beer Match trophy to a very jubilant Laundry crew, who took it out for the second year in a row. 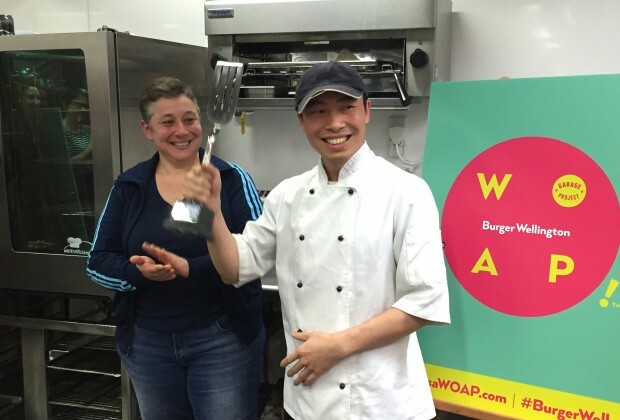 Finally, Laura Greenfield had the honour of awarding Best Burger to Apache for their terrific Bang Bang Burger. Congratulations, Apache! A well-deserved winner indeed. If you missed out on these burgers, don’t despair, some of them will be hanging around for a little longer. Hippopotamus, Nanny’s Food Truck, Apache, Laundry, Egmont Street Eatery and Louis Sergeant will all keep their burgers on their menus for a limited time, so drop in while you can!